Polenta is typically Italian although its popularity is slowly but surely spreading over the United States and the rest of Europe. This ingredient is made with ground cornmeal. The cornmeal is boiled in water and ground finely or coarsely. It can be made with white or yellow cornmeal. Traditional polenta needs to cook for an hour and you have to stir it all the time. There are some “quick-cooking” varieties on the market now though, since not everyone has the time (or the inclination!) to stand over a hot stove for that long. The quick-cook kind does not taste quite as good as the original kind but if you are using it to make a recipe such as baked polenta loaf, it will be fine. Use cooked polenta to top meat, fish, poultry, cheese, or vegetable dishes. It might surprise you to know that this tasty ingredient is more popular in the north of Italy than pasta, so if you thought Italians ate mainly pasta and pizza, you might like to taste this interesting ingredient for yourself. It is also enjoyed in Slovenia, Mexico, Romania, and Switzerland. It tastes a bit like grits. Grits are made from white corn and the corn is chemically treated before it is ground. Cooked polenta will set overnight in the refrigerator and then you can cut it into squares and broil or bake it. You can also cut it in half and stuff it. It is lighter than cornbread and goes well with cooked meats. You can also use this to make pizza, instead of using a traditional pizza crust recipe, because it is dough-like and firm. The following recipe makes enough to serve six people and this delicious loaf is sliced in half and filled with cheese, basil, salami, tomatoes and olives, to make a really flavorful meal. You can use prosciutto instead of the salami if you prefer. Bring the chicken broth to a boil in a big pot and whisk in the polenta gradually. Turn the heat down to a simmer and cook it for fifteen minutes or until it is very thick. Keep stirring the mixture as it cooks. Take the pot off the heat and stir in the parsley, butter, and half a cup of parmesan. Let the mixture cool a little, then press it into a glass dish and let it cool to room temperature. Refrigerate it overnight or for a few hours, until it is firm. Turn it out of the dish and slice it crosswise in half. Put the bottom half back in the dish. Arrange the salami slices over the top, and then add the black olives and chopped tomatoes. Mix the basil with the mozzarella and remaining parmesan and spread half of this over the salami, olives, and tomatoes. Put the top half of the loaf back on top and sprinkle the rest of the basil and cheese mixture over the top. Bake at 400 degrees F for half an hour or until hot. The top should be crispy and golden brown. If it is not, you can broil the polenta loaf for a few minutes. Let it cool a bit, then serve warm. 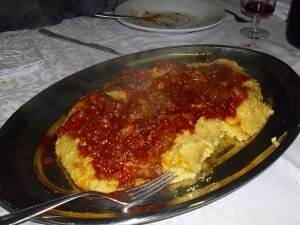 If you like polenta and other typical Italian recipes you will love authentic pizza recipes. No matter what your favorite flavors happen to be, there are lots of types of pizza that you can make at home with ease. Homemade pizza recipes are easy to prepare and taste amazing. GreatPizzaRecipes.com You Make the Pizza, We Help You Make It Great!